There is a lot to these inexpensive cruises. The entertainment and buffet are worth the $25 fee. With a coupon, it’s $23. You also have three decks with slots, craps, other table games like 3-card poker, blackjack, etc. There’s no one stopping you from just sitting outside on a deck enjoying the sun, the stars, or watching a rocket being shot off another ship at sea. The servers are super friends, whether a waitress in the café, or, a gal bringing drinks, table dealers, or the men in security. 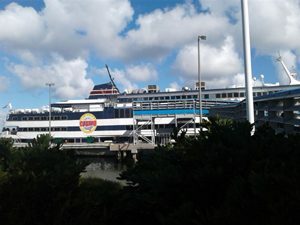 My son and I were on one of the buffet afternoon cruises that go out at 11 a.m. My son asked me to carry his wife’s large vintage faux leather bag so he could chuck into it – a book, his reading glasses, a cribbage board, and a deck of cards. If I could pull myself away from a 3-card poker table, we would play cribbage out on the upper deck. I carried a little Mexican bag around my waist with sunglasses and cash. Didn’t need the big bag, but carried it because he asked me to. After my driver license verified my identity, one of the security men, the tallest and strongest, looked down at me and said sternly, “You can’t bring a deck of cards on the ship.” They let me keep the cards, however, and I went back to the 3-card table where one of the players greeted me, “I see you found your bag.” This time when I left the table, I looked at several of the friendly faces and said, “In unison now, you’re supposed to say, ‘Don’t forget your bag.”’ So, they did, and we all laughed. The ship was returning to port when I joined my son and the crowd who were gathered on the top deck sitting in easy chairs listening to the entertainment. Vic Picone, leader of the musical four-person male group called Eleqants, took the stage then and introduced their 1950—1980’s music, “I see we all went to the school at the same time.” He went on, “In l958 we had the song, Little Star, that sold over five million copies;” then the group sang the song which brought them such recognition. As we left the ship, several staff members were there to clap and bid us goodbye. These included one dealer, who noticed my son carrying the large bag under his arm, “I see your bag is safe,” she called. Shirley Buchanan in the Victory office told me later that they advertise the Victory Cruise on billboards, television, radio, and print, and once had a second ship that sailed out of Jacksonville. “You can call our main office at 321-799-0021 if you want us to mail you a coupon.” She had huge burst of laughter when I told her I was calling my travel article: The World’s Shortest Ocean Cruise.